The Navarre Beach Area Chamber of Commerce will kick off its 11th Annual Free Summer Concert Series on Thursday, May 31, 2018. 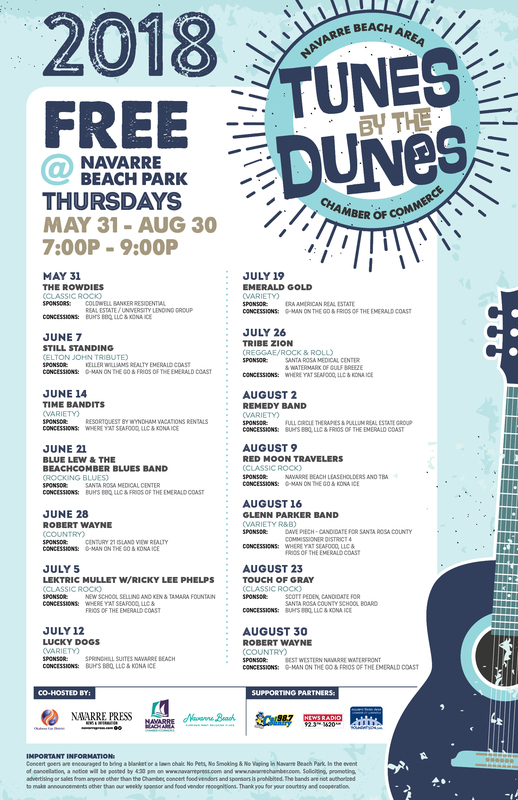 In 2017, "Tunes by the Dunes" (formerly Thursdays in the Park) relocated from Navarre Park to Navarre Beach Park’s Sand Crab Pavilion, just east of the Navarre Beach Fishing Pier. Co-hosted by the Okaloosa Gas District, Navarre Press, Santa Rosa County Tourist Development Office, Chamber Foundation and Cat Courty 98.7, the summer concert series offers an exciting line-up of 14 FREE outdoor concerts every Thursday (7-9 pm), from May 31 to August 30, 2018. The series will showcase a variety of local musicians with the Gulf of Mexico and sunset as the backdrop. Each night, from 7 to 9 pm you will find a different genre of music ranging from Jazz, Reggae, Southern Rock, Country, Oldies and much more. Spectators are encouraged to bring their beach blankets and lawn chairs for a night of free family entertainment. Come hungry as concessions will be provided by some of our Navarre Chamber member restaurants and a dance area will be provided for you to work off those extra calories. As a reminder, smoking is prohibited and pets are not allowed. In the event of inclement weather, the Navarre Beach Area Chamber of Commerce will announce cancellations by 4:30 PM the day of concert. To ensure you have the most up-to-date information on Tunes by the Dunes, please like the Navarre Beach Area Chamber of Commerce on Facebook.